12 Days of Christmas Card Challenge from Prima! November Projects for Blue Fern Studios! "Big Moment" Mini Album Cover: December MMM Kit! "Autumn": Magnifique Mixed Media November Kit~! Blue Fern Studios: November Sketch Challenge! love that the Messy Head and Domestic Goddess collections came together here for a super girly layout of my daughter. Fun imagery from Domestic Goddess was paired with the urban elements of Messy Head, making for a truly enjoyable creative experience! We were also given the opportunity to create with VLV Stamps this month. 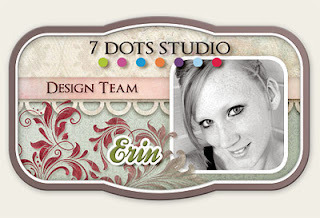 I had fun scattering the Hearts and Dots background stamp, and using the Film Strip stamp to accentuate the center strip that runs through my layout. Thank-you to VLV for the opportunity to use these amazing stamps!! Messy Head Collection "Love Letter"
Messy Head Collection "Big Words"
Thanks for letting me share with you today! Erin this is adorable! It instantly caught my eye! I love all your work but I think this one has become my favorite! This looks amazing, your colors in the back ground are fabulous.. love the photos too.. another stunning layout! Such a beautiful layout and all the textures and colours on the background page are just so subtle and lovely. Such a beautiful page Erin. I love your mixed media on the background. This is so pretty, Erin! I love that tiny hearts and dots stamp. Cool photos and a cool/sweet page. Love the weekday words you used. Gorgeous page! Completely love this Erin!! Hi this is gorjuss indeed, I lovelove love the colours. Totally in love with this gorgeous layout!!! What an amazing lay-out! I love every little bit of it! This is gorgeous Erin!! I love every inch of it! Soft colors and the way you did the LO is really beautiful! What an adorable photo and just love your soft colours and texture in the background. Stunning. You created a perfect combination of 7 Dots Studio products! Layout looks amazingly!